The City of Grove City has been working with Pizzuti Companies on the design, physical improvements and implementation of the Town Center Plan since 2012. The most recent element was prepared in coordination with Braun & Steidl Architects to plan for and accommodate the parking needs within Town Center. 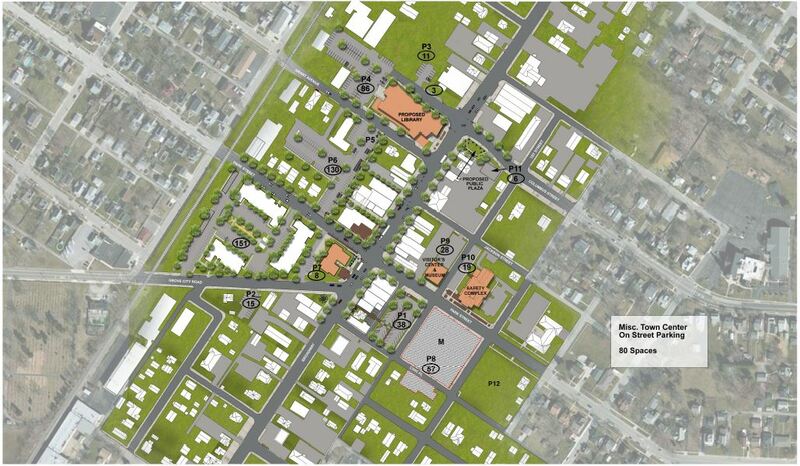 It should be noted that there have been multiple iterations, all of which have been based on the principles of the 2008 Town Center Plan, as well as the schematics of the streetscape improvements associated with the 1987 Trott & Bean Architects plan. As part of previous redevelopment efforts, a parking study was conducted by Desman and Associates in 2009, looking at inventory of public and private spaces. The City Administration participated in a Town Center Parking Forum, hosted by Grove City Town Center, Inc. At this meeting the City presented the information to help further the discussions surrounding the potential acquisition of land to accommodate future public parking facilities. At the Council’s first meeting in November, the following ordinances and resolutions regarding the potential land acquisition and pedestrian promenade were acted upon and approved. C-74-15 – Authorize the Purchase of Part of the Properties located at 3448, 3454 and 3460 Park Street and Appropriate $450,000.00 from the General Fund for said purchase and related expenses. C-78-15 – Authorize the Purchase of Part of the property located at 3464 Park Street and Appropriate $100,000.00 from the General Fund for Said Purchase and related expenses. C-79-15 – Authorize the Purchase of the property located at 3468 Park Street and Appropriate $200,000.00 from the General Fund for said purchase and related expenses. CR-68-15 – Eliminate the Pedestrian Promenade connecting the residential development and the new library as previously endorsed by Resolution CR-42-13.